"Kuroshio" redirects here. For other uses, see Kuroshio (disambiguation). The Kuroshio (黒潮), also known as the Black or Japan Current (日本海流, Nihon Kairyū) or the Black Stream, is a north-flowing ocean current on the west side of the North Pacific Ocean. It is similar to the Gulf Stream in the North Atlantic and is part of the North Pacific ocean gyre. Like the Gulf stream, it is a strong western boundary current. The Kuroshio Current—named for the deep blue of its waters—begins off the east coast of Luzon, Philippines, Taiwan and flows northeastward past Japan, where it merges with the easterly drift of the North Pacific Current. It is analogous to the Gulf Stream in the Atlantic Ocean, transporting warm, tropical water northward toward the polar region. The path of Kuroshio south of Japan is reported every day. Its counterparts are the North Pacific Current to the north, the California Current to the east, and the North Equatorial Current to the south. The warm waters of the Kuroshio Current sustain the coral reefs of Japan, the northernmost coral reefs in the world. The branch into the Sea of Japan is called Tsushima Current (対馬海流, Tsushima Kairyū). Western boundary currents transport organisms long distances rapidly and a variety of commercially important marine organisms migrate in these currents in the course of completing their lives. 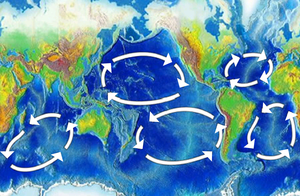 Subtropical gyres occupy a large fraction of the world's ocean and are more productive than originally thought. In addition, their fixation of carbon dioxide is an important factor in the global budget for carbon dioxide in the atmosphere. Satellite images of the Kuroshio Current illustrate how the current path meanders and forms isolated rings or eddies on the order of 100 to 300 kilometres (60 to 190 mi). Eddies retain their unique form for several months and have their own biological characteristics that depend on where they form. If the eddies are formed between the current and coastline of Japan, they may impinge on the continental shelf; their high kinetic energy has the effect of drawing large volumes of water off the shelf on one side of the ring, while adding water to the other side. The eddies size and strength decline with distance from major ocean currents. The amount of energy decreases from the rings associated with the major currents and down to eddies remote from those currents. Cyclonic eddies have the potential to cause upwelling that would affect the global primary-production budget. Upwelling brings cold, nutrient-rich water to the surface resulting in an increase in productivity. The biological consequences for young fish populations that inhabit the shelf are quite large. The Oyashio Current colliding with the Kuroshio Current near Hokkaido. When two currents collide, they create eddies. Phytoplankton growing in the surface waters become concentrated along the boundaries of these eddies, tracing out the motions of the water. The Kuroshio is a warm current—24 °C (75 °F) annual average sea-surface temperature—about 100 kilometres (62 mi) wide and produces frequent small to meso-scale eddies. The Kuroshio Current is ranked as a moderately high productivity ecosystem—with primary production of 150 to 300 grams (5 to 11 oz)—of carbon per square meter per year—based on SeaWiFS global primary productivity estimates. The coastal areas are highly productive and the maximum chlorophyll value is found around 100 metres (330 ft) depth. There are indications that eddies contribute to the preservation and survival of fish larvae transported by the Kuroshio. 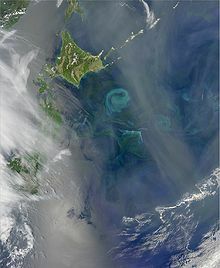 Plankton biomass fluctuates yearly and is typically highest in the eddy area of the Kuroshio’s edge. Warm-core rings are not known for having high productivity. However, the biology of the warm-core rings from the Kuroshio Current show results of productivity equally distributed throughout for a couple of reasons. One is upwelling at the periphery; the other is the convective mixing caused by the cooling of surface water as the ring moves north of the current. The thermostad is the deep mixed layer that has discrete boundaries and uniform temperature. Within this layer, nutrient-rich water is brought to the surface, which generates a burst of primary production. Given that the water in the core of a ring has a different temperature regime than the shelf waters, there are times when a warm-core ring is undergoing its spring bloom while the surrounding shelf waters are not. There are many complex interactions with the warm-core ring and thus lifetime productivity is not very different from the surrounding shelf water. A study in 1998 found that the primary productivity within a warm-core ring was almost the same as in the cold jet outside it, with evidence of upwelling of nutrients within the ring. In addition, there was discovery of dense populations of phytoplankton at the nutricline in a ring, presumably supported by upward mixing of nutrients. Furthermore, there have been acoustic studies in the warm-core ring, which showed intense sound scattering from zooplankton and fish populations in the ring and very sparse acoustic signals outside of it. Copepods have been used as indicator-species of water masses. It has been suggested that copepods have been transported from the Kuroshio Current into southwest Taiwan through the Luzon Strait. The Kuroshio intrusion through the Luzon Strait and further into the South China Sea may explain why copepods show a very high diversity in adjacent waters of the intrusion areas. The Kuroshio Current intrusion has a major influence on C. sinicus and E. concinna, which are two copepod species with higher index values for winter and originate from the East China Sea. During the southwestern monsoon, the South China Sea Surface Current moves northward during the summer toward the Kuroshio Current. As a result of this water circulation, the zooplankton communities in the boundary waters are unique and diverse. The biomass of fish stocks depends on the biomass of lower trophic levels, primary production and on oceanic and atmospheric conditions. In the Kuroshio-Oyashio region, the fish catches depend on oceanographic conditions, such as the Oyashio’s southward intrusion and the Kuroshio’s large meander south of Honshu. The Oyashio Current contains subarctic water that is much colder and fresher than the resident water east of Honshu. Thus, the fish intrusion affects recruitment, biomass, and catch of species such as pollock, sardine, and anchovy. When the Oyashio is well developed and protrudes southward, the cold waters are favorable for sardine production. The Kuroshio large meander development correlates with sardine recruitment and catch due to the proximity of the Kuroshio meander to the southern spawning grounds of sardine. The Japanese Flying Squid (Todarodes pacificus) has three stocks that breed in winter, summer, and autumn. The winter spawning group is associated with the Kuroshio Current. After spawning in January to April in the East China Sea, the larvae and juveniles travel north with the Kuroshio Current. They are turned inshore and are caught between the islands of Honshu and Hokkaido during the summer. The summer spawning is in another part of the East China Sea, from which the larvae are entrained into the Tsushima current that flows north between the islands of Japan and the mainland. Afterward, the current meets a southward flowing cold coastal current, the Liman Current, and the summer-spawned squid are fished along the boundary between the two. This illustrates the use of these western boundary currents as a rapid transport that enable the eggs and larvae to develop during winter in warm water, while the adults travel with minimum energy expenditure to exploit the rich northern feeding grounds. Studies have reported that annual catches in Japan have gradually increased since the late 1980s and it has been proposed that changing environmental conditions have caused the autumn and winter spawning areas in the Tsushima Strait and near the Goto Islands to overlap. In addition, winter spawning sites over the continental shelf and slope in the East China Sea are expanding. ^ a b Chisholm, Hugh, ed. (1911). "Kuro Siwo" . Encyclopædia Britannica. 15 (11th ed.). Cambridge University Press. p. 953. ^ Japan Coast Guard. "Quick Bulletin of Ocean Conditions". ^ a b c Belkin, I., "Kuroshio Current: LME #49"